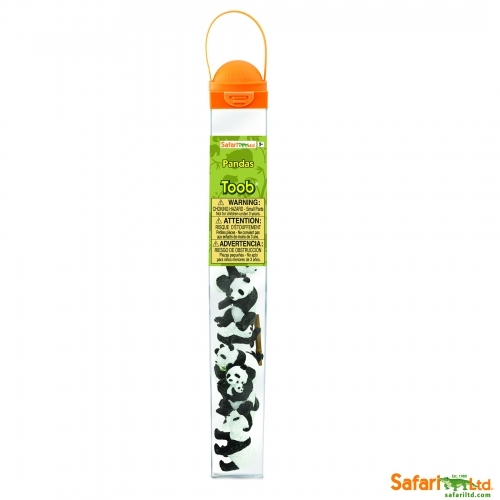 Tumbling out of this Safari Toob are 9 pandas in various positions, all hungry for some bamboo! Did you know that although pandas are technically carnivores, their diet is 99% bamboo? In fact, they can eat up to 40 pounds of it a day! Scientific Name: Ailuropoda melanoleuca. Capturing not only the iconic coloration but also the lackadaisical demeanor of these magical animals, this Toob is complete with pandas lazing around, caring for their young, climbing, and enjoying some bamboo. 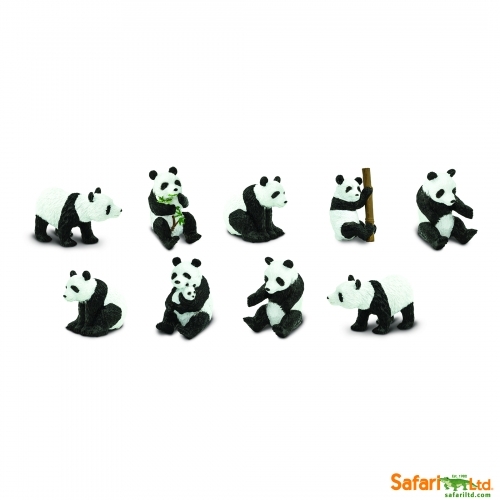 Not only are these figurines adorable, but they depict actual activities that pandas take part in in the wild. One of the most protected species on planet Earth, the panda is a conservation reliant species. Due to a loss of their natural habitat as well as the many difficulties they face when breeding, panda numbers haven't yet been able to rebound to a safe and stable amount from their initial large decline. Despite this, pandas are one of the most protected species of animal worldwide and every measure is being taken to ensure these beautiful creatures remain with us for many years to come.